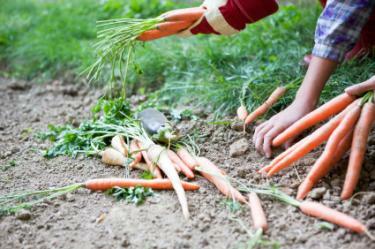 The process of learning how to grow an organic vegetable garden may seem intimidating at first, but if you break it down into steps, it becomes manageable and fun. Growing your own organic vegetables can also help save money and trips to the farmers' market or grocery store. Even if some of your crops aren't successful, you'll likely be able to grow more than enough produce for your family. Plan your vegetable garden as far in advance as you can so that you can prepare your plot of land, get all the equipment you need, and save time when it is time to plant and harvest. As you are planning an organic garden, determine how you can take advantage of natural resources you already have. Choose your plot with care. Choose a garden location on the south side of your home or an open field, and make sure the area receives sufficient sunlight for the vegetables to thrive. Fence off the garden, if possible, in areas where there are excessive animal populations, such as deer or raccoons, that will eat the crops. Determine which plants you want to grow, since soil amendments are specific to the plants in your garden. Think about how many types of vegetables you want to grow, how many of each seed to plant for your desired yield, and how much growth space each type of plant requires. All these factors determine the size of your garden patch. If you don't have enough room in your yard for the size of garden that you want, consider finding a community garden plot or growing some of your plants in containers. One of the foundations of organic gardening is having the proper soil to nurture your plants. The ideal soil is a composition of equal parts sand, clay, and silt and should be composed of about five percent organic matter. To determine the quality of your soil, test it using a test kit, which is available at most gardening centers or your local Cooperative Extension Service office. If it needs amending, use organic fertilizer to balance the nutrients in the soil as needed for your plants or add manure or compost. Green manure is any plant substance grown specifically for turning into the soil. The most common are legumes and grasses, which add nutrients like nitrogen to the soil. 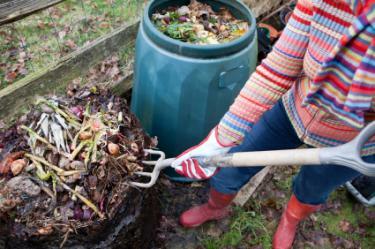 Composting adds nutrients to your garden. Compost can be composed of any decaying organic matter, with a few exceptions (onions, bones, meat, and so on). Add two or three inches to soil and work in thoroughly. 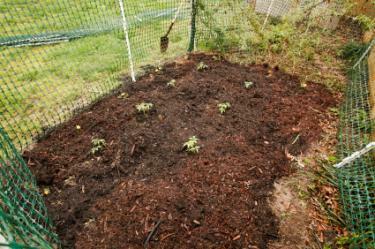 Weed the garden and remove any rocks or other hard objects that could interfere with the vegetables' growth. Invasive plants, including Bermuda grass, should be completely removed so they do not take over the garden and kill the vegetables. Periodically repeat this maintenance on your garden throughout the growing season to keep it uncluttered and healthy. Use a tiller to till in any grass or other vegetation in the area so that nutrients are kept within the soil. Till the garden to a depth of 10 to 12 inches. Don't forget to buy organic seeds. Botanical Interests: These seeds are certified organic by the USDA and guaranteed to be untreated and non-GMO. The company offers a wide selection of heirloom and organic vegetables seeds. Burpee: Browse their wide selection of organic vegetable seeds to get some inspiration for what to plant in your garden. A nice plus of ordering from Burpee is they include free organic plant food in qualifying orders. Seeds of Change: Organic gardeners have depended on Seeds of Change for over twenty years as a go-to supplier of organic seeds. They are certified organic by Oregon Tilth, and offer both a Safe Seed Pledge and a money back guarantee. Seed Savers Exchange: If you are looking for heirloom or rare vegetable varieties, the Seed Savers Exchange is a good place to shop. They also offer a Safe Seed Pledge and their seeds are not chemically treated or genetically modified varieties. Before you make your final selections, inform yourself about which vegetables grow well together and which do not. If you plant your vegetables in the way that helps them thrive, you'll have a smaller chance of failure and a bigger chance of getting a bumper crop when it's time to harvest. Carrots are easy to grow. Follow directions for the seedlings or on the seed packets as they will tell you how deep to plant, how far apart to space the plants, and whether to plant seedlings or seeds in full or partial sun. To grow properly, your garden needs lots of sun, the proper amount of water, regular attention, and protection from bugs and weeds. Consider installing a drip hose to water the plants and cover the exposed soil with mulch to inhibit weeds. This ensures that all the water is going to the plants' roots rather than splashing up on the plants, which is less wasteful and better for the plants. However, to make your garden more sustainable, consider collecting fallen rainwater to use later in watering the garden. Water plants regularly until they are about six to eight inches high, and then water as needed for the plant type. Tomatoes and watermelon, for instance, need lots of water to set their fruit. Overwatering leads to plants that are waterlogged and more likely to become disease infested. Remove any plants from the garden as soon as you spot any signs of disease, such as plants with discolored leaves. 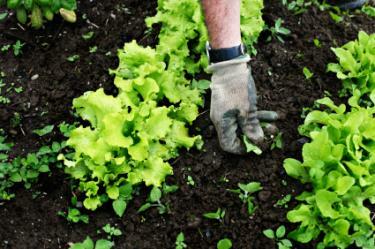 Weeding is an important part of organic gardening. Weed, inspect the plants for disease and pests, and add more compost as needed. Some plants, like tomatoes and watermelons, are known as "heavy feeders," which means that they may require some applications of an organic plant food during the growing season for the highest yield. Be diligent in caring for the garden. If you're a first-timer, ask for tips and tricks from neighbors, other experienced gardeners, or the agents at your local Cooperative Extension office. If you keep the seed packets or instructions that come with each of the vegetables you planted, there should be information to help you determine when your crops are ready to harvest. Pick vegetables when they are ripe to encourage more production from your plants. Spray a natural pepper or garlic spray on your garden. Use insecticidal soaps and other organic pest killers to control your pest problems. Simply remove the offending bugs (like grubs and slugs) when you see them and relocate them to another area. Scented marigolds drive off pests and kill nematodes. Nasturtiums are perfect companions for cucumber and squash, since they repel insects that favor those plants, and they get rid of aphids as well. Attract beneficial insects like ladybugs, which eat aphids, by planting coreopsis, geraniums, cilantro and white cosmos or buy them online. Plant early in the season since most insect infestations worsen in the later part of the growing season. 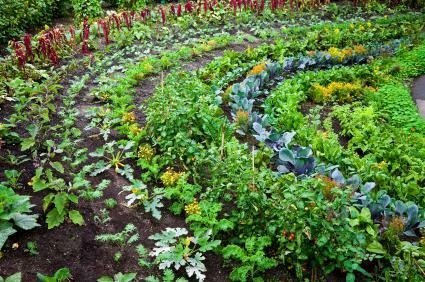 One important element of organic gardening for vegetables is to seek out the most natural alternatives. Plants thrive when provided with good soil, adequate sunlight and naturally introduced nutrients. Start out with hardy vegetables that are easy to grow and can withstand difficult soil conditions better than some other crops. Successful organic gardening provides many benefits such as letting you get your hands dirty and enjoying really delicious, fresh food without harming the planet with pesticides.